Use powerful Airtorch for continuous VOC removal or use for rapid heat treatment and/or surface treatments like finishing to hardfacing. The Airtorch™ can be used for curing, surface burning and sealing and simulation operations. 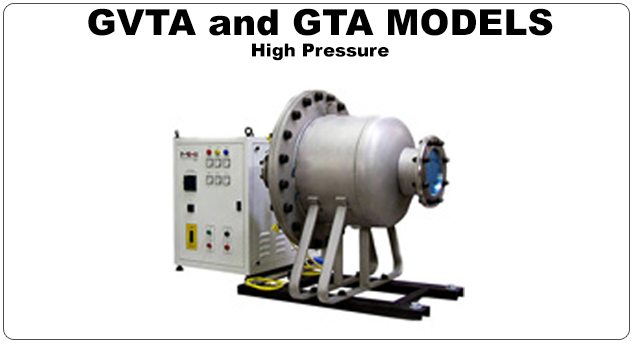 The possibilities are endless as Air, Nitrogen, Helium and Argon can be used. During combustion the time for 98% combustion can change by several orders of magnitude for 100K rise in air temperature. Arrhenius equation and influence of Temperature. Fuel Cells, High velocity drying and surface heating including simulation. Contact MHI for Nozzles supplied. The Airtorch™ allows large die heat-up; reclaim dies and aluminum. Combustion/flow simulation, curing, dryin or bonding of paper boards. Removal of inorganic and organic salts, fuel celss, general heat treatment fr bending and deflashing/deburring,, drum heating, plastic rolls, welding organics like plastic soldering disinfection, drying, rapid paper and pulp dry. With a 4 kW machine plan to dry 2-4 Kg/hr of desiccant. Free and bonded water can be easily removed. The Airtorch™ can achieve very high temperatures without contamination, therefore direct drying is a natural application. 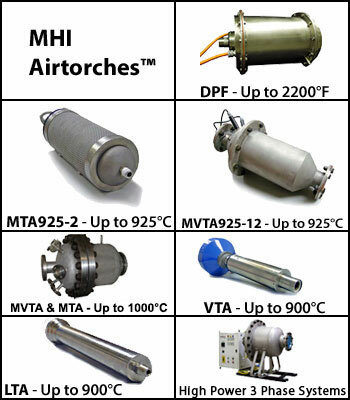 MHI also manufactures several Airtorch™ Continuous ovens. Small Airtorch Augmentation for Heat Treatment Furnaces- typical ROI. Easy, uniform, safe, and collectable binder burn off. For ceramics, nitrides, powder metals, etc. Substantially improve quality and productivity. When high temperatures are needed in spaces where resistance heating elements cannot be used, the Airtorch™ provides the solution. Temperature variations matter during adhesive resin curing. Temperature profiling is particularly is important with an 8 Data Log during start up and cool down. Airtorch is instantaneous and uniform. OAB steam is instantaneous. Hybrid. * Estimate only- subject to change. The estimate will vary by application, VOC removal consideration price is considerered primarily from gas stream only. All ROI's require a 30 day assesment as the assesment may not be current. Designed for long life and high temperatures, the non-contaminating Airtorch™ is an ideal solution for inline packaging or sealing processes. Use the Airtorch™ as a preheating device for dies in the metal forging and rolling industries. Use the Airtorch™ for softening, soldering, and melting of precious metals and glass. This feature is very applicable to the dental, jewelry, and glass industries. Use for rapid glazing, burnout and quick melts. Special Convective Ovens are also available. 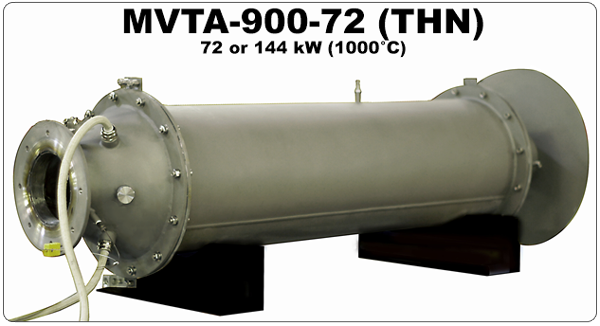 Heating: Create a convective cavity around the assembly using two 4kW Airtorch™ units. Fixture Airtorches™ behind mold and electrodes at angles to create air movement. This should improve the overall heating of the mold. Insulation: The assembly is surrounded by refractory blankets (all 5 sides) to retain as much heat inside as possible. Blankets can be supplied by MHI at customer's request. Solution: By supplementing the existing electrodes with the Airtorch™ and blankets, the watt density is increased on the mold thus reducing the workload of the existing electrodes which should improve performance and life. Other results include an increase of uniformity across the mold surface. Call MHI for more information. Use powerful CleanElectricFlame™ for continuous VOC removal or use for rapid heat treatment and/or surface treatments like finishing to hardfacing. The operating cost estimate per pound of VOC removed is about ~0.5¢*, for normal ppm contamination concentration removal. Compare with over $4/lb. Please contact MHI to verify calculations.